Catherine Solyom, Montreal Gazette, November 16, 2013– About 130 communities across Canada held simultaneous protests Saturday against the expansion of oilsands production and of pipelines to bring the oil east from Alberta, including a protest in Oka, where Kanesatake residents want to stop the reversal of Enbridge’s Line 9B pipeline. Three buses left Montreal on Saturday morning to take part in the protest, where members of the Idle No More movement, representatives of Québec solidaire and prominent activist Ellen Gabriel addressed the crowd of a few hundred people. 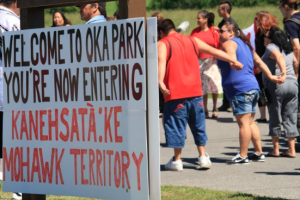 Kanesatake Mohawks are opposed to the expansion of oilsands production in Alberta to the detriment of First Nations communities there, and to the reversal of the flow of Enbridge’s 9B pipeline through Mohawk territory. The pipeline carries oil west, from Montreal to Westover, Ont., but Enbridge has applied to the National Energy Board to be allowed to ship oil from Western Canada to Montreal, where it would be processed in east-end refineries. The NEB held public hearings on the project in Montreal and Toronto last month. A decision from the board is expected by January. But after a year of demands by several Quebec municipalities, including the city of Montreal, and environmental groups for Quebec to hold its own hearings into the pipeline project, the Quebec government announced this week a parliamentary committee will hold hearings from Nov. 26 to Dec. 5, with a report to be submitted to the National Assembly by Dec. 6. Opponents of the project, however, including the David Suzuki Foundation, the Association québecoise de lutte contre la pollution atmosphérique and Équiterre, are not satisfied. They said only the government will be able to ask questions of Enbridge, the hearings are to be held only in Quebec City and the issue of greenhouse-gas emissions from oilsands production does not appear to be among issues that will be discussed. In Oka on Saturday, where banners compared Enbridge to the Montreal & Maine Railway, which had a deadly train crash in Lac Mégantic, Québec solidaire president Andrés Fontecilla told the crowd they want the parliamentary commission to be given a wider mandate to look into all the potential environmental consequences of the project. The “Defend Our Climate” protests, which took place in communities from Happy Valley-Goose Bay in Labrador to Tofino, B.C., were intended to show a wall of opposition from coast to coast against the continuing expansion of the oil industry to the detriment of future generations, said Jean Léger of the Coalition vigilance oléoduc (COVO). “We, our children and our grandchildren will not sit idly by while the oil industry dictates the level and growth rate of greenhouse-gas emissions in this country,” Léger said.